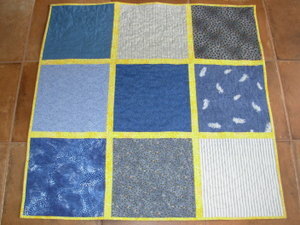 I've been inundated with baby quilts these days, but did manage to finish one this weekend. This is made for our local Community Baby Shower being organized by our Soroptomist's International Club. They are collecting all sorts of baby items for local parents. I bought a very cute outfit, but thought that a quilt was in order. 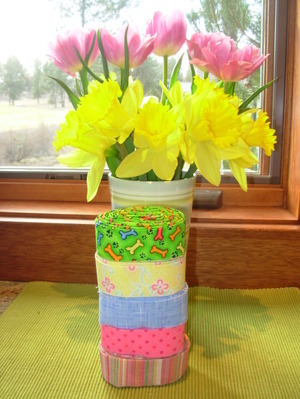 This is very quickly made, but I tried to machine quilt it by Kathy's method. I've finally decided that I'm never going to get better with free motion machine quilting, so I think I'll stick to straight line quilting in the future. In addition to that I got a little carried away when I made the binding and ended up making bindings for 5 of the other baby quilts I'm working on. I really like making these double fold bindings and usually have them rolled up and ready to go long before the quilt is ready for them. In other news, I finished my second pair of Embossed Leaves Socks. This pattern is from Interweave Knits and is available in their new book: Favorite Socks. I don't actually have the book because I discovered that I have all the patterns that I really liked in my copies of the magazine. If you haven't been buying the magazine, this book is a great compilation. 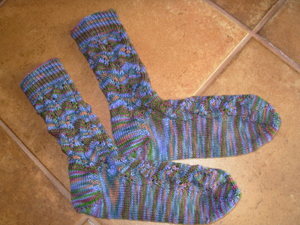 This is Socks that Rock lightweight, colorway- Titania. I put a Project Spectrum tag on this because I think the quilt fits that category and maybe the socks too. My official PS WIP is Rogue which continues to grow. I'm on the rather uninteresting part of the back with no cable detail, so not much to see. One sleeve is up to the top of the cable portion as well and I can see that there may be some stalling now that the interesting parts are over. I do love it though and would like to be able to wear it before our cold weather ends. We've been having the strangest weather. It will be in the 60's one day and 30's the next. That's weather in Central Oregon though. They say here, if you don't like the weather, wait 5 minutes! Lastly, my sister has opened an Etsy shop (Silly Dog Art Glass) with her beautiful fused glass jewelry. She'll probably add more types of items as time goes on. Way to go, Cheryl!